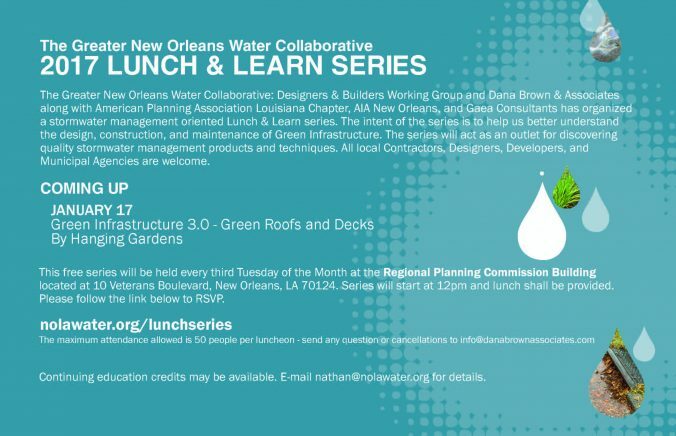 In 2016, the Water Collaborative debuted a highly successful series of lunchtime lectures on green infrastructure concepts and technology. Hosted at the Regional Planning Commission, those Lunch & Learns provided 100 area engineers, architects, planners and floodplain managers with new tools to meet or exceed local standards for stormwater management and water quality protection. In 2017, we continue our commitment to multidisciplinary professional development, kicking off a new series of Lunch & Learns on Jan. 17 with a talk on green roofs and decks. A special thanks is due to our member-partners Dana Brown & Associates and Gaea Consulting as well as local chapters of the American Planning Association and American Institute of Architects. With their help, we are able to offer continuing education credits for many of the presentations in the series. Space is limited, however, so you must RSVP here to attend.